Consent and transparency have long inherited the margins of organizations' pursuit of customer information. And the EU's General Data Protection Regulation (GDPR) was a much-needed push to bring them to the center. With the regulations that came into action in May 2018, it handed EU customers the power to control their personal information that businesses store and handle, without tradeoffs. The core of Chargebee's internal operations underpins protecting the personal data of our customers. We only collect and store information that is necessary to offer our service, and we do this with the consent of our customers. Adding to this, our approach towards privacy, security, and data protection align with the goals of GDPR. Along with a highly secure and robust system architecture, we have a variety of security measures in place to prevent unauthorized access and processing of personal data. To know more about our technical and organizational security measures, check out our security page. By setting up an internal compliance team (with functional heads) who worked with an external specialist from a global audit firm, our requirements were assessed and the required changes were rolled out. Chargebee recognizes its responsibilities as a data controller towards its customers. 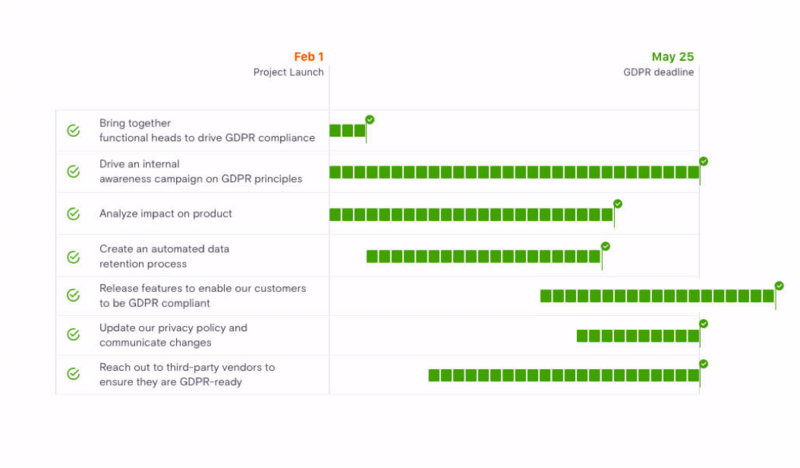 Detailed out below are all the steps we have taken towards fulfilling all legal obligations under GDPR, as a data controller. We will clear the customer’s Personally Identifiable Information (PII), and all end-user data from our databases, within a period of 120 days. This includes deleting the customer’s website and all their end-user information from our systems. The only data retained by us will be that which is needed from a compliance and legal standpoint, like invoices, subscription information, audit logs, etc. We will also automatically delete stand-alone test sites that remain inactive for a period of 6 months. We have a data processing addendum for our customers, that incorporates our GDPR principles. Please reach out to our support team (support@chargebee.com) if you require a signed copy of the same. We collect consent from our customers wherever it’s applicable—especially for sending any marketing communication to them. Consent is collected from our customers during sign up, and it can also be easily withdrawn anytime from within the app. This way, we place consent at the center of our data processing. We have an active process in place that guarantees all our features meet the standards of GDPR. Our product and engineering teams takes into account Privacy by Design and Privacy by Default while designing features and pushing them to production. In whatever we do, we ensure that we go the extra mile to make our customers' lives easier. And our GDPR compliance efforts are no exception. In addition to making Chargebee GDPR compliant, we wanted to help our customers (or merchants) leverage Chargebee to become GDPR compliant as well, without having to break a sweat. Connecting both the merchant and the end-user, we allow merchants to collect, record, and withdraw consent, directly from the checkout pages and customer portal. We have charted out a plan that will help merchants handle their customers’ PII data when a customer cancels their subscription with the merchant. This allows merchants to clear PII data while still ensuring that numbers are not affected in the aggregate reporting of data. This is available in the app and as an API. Our self-serve portal is now fully configurable— it enables merchants to give their end-users the option to view, update, edit or clear any personal information they have shared with them. While this is only the first step towards our commitment to help you handle the requirements of data privacy and protection, we are continuing to explore other features in the context of GDPR and data security. We encourage you to reach out to us at support@chargebee.com if you have any feature requests, and we are happy to discuss its feasibility.